The award-winning* Megger MFT1741 Multifunction Tester is the most advanced model in the Megger MFT1701 range, building on the impressive capabilities of the MFT1731. In particular, it boasts a new confidence meter which indicates the reliability of a reading and enhanced loop testing hardware which negates the effects of RCDs on loop impedance values. As with other instruments in the MFT1701 range, the tester is ideal for use on residential, commercial and industrial low voltage installations for certifying systems in accordance with BS7671 and Part P of the building regulations. With loop impedance readings after just four seconds, the MFT1741 has the fastest and most accurate no-trip loop testing procedure on the market. The advanced three-wire no-trip loop impedance test on the Megger MFT1741 is extremely useful for when RCDs or RCBOs prevent the use of high current two-wire tests as regular no-trip tests are susceptible to interference from noise and harmonics. The tester automatically detects and compensates for such interference after performing the initial loop test, thus enabling stable, repeatable loop tests on noisy circuits. This compensation is tracked by the contraction of the Confidence Meter arc displayed above the reading as the figure is adjusted. If the arc fails to totally contract, this suggests that the final reading is likely to be unreliable whilst a complete contraction indicates high reliability. 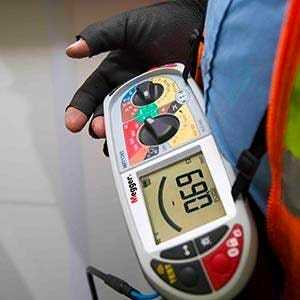 The Megger MFT1741’s Confidence Meter therefore lessens the need for repeat readings of earth loop impedance by confirming when a reading is very reliable. If the arc shows a low reliability level, the user can take steps to improve the reading such as bypassing RCDs or taking repeat readings. The second main innovative feature of the Megger MFT1741 is the advanced loop testing hardware that negates the effects of RCD impedance uplift. Testing through RCDs can often produce overly high loop impedance readings because of resistance in the coil of some RCDs and normal MFTs cannot distinguish between the two. The three-wire test function on the MFT1741 uses a variety of test currents and measurement methods to prevent skewed readings due to RCDs. It is equally adept testing through 10mA devices as it is through 30mA devices and can even perform no-trip tests through Type B RCDs, resulting in improved versatility and accuracy. 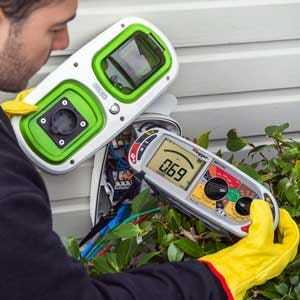 Aside from its patent-pending confidence meter and enhanced loop impedance test, the Megger MFT1741 also performs a full range of tests for accurately verifying new or repaired electrical installations. These functions include continuity testing at 15mA and 200mA; insulation resistance testing at 100V, 250V, 500V and 1000V; RCD testing (ramp, manual and auto); true RMS voltage measurement; and two/three pole earth testing. It is even capable of ART and stake-less testing although additional accessories are required. B-type and three-phase RCS can be tested with this instrument. Readings for all tests are shown on the Megger MFT1741’s backlit LCD display in both digital and analogue format and it is very easy to select the appropriate function thanks to the two clearly-labelled dials. The MFT benefits from intuitive operation and can store results to its internal memory which can then be downloaded using supplied Megger Download Manager which is provided as standard with the instrument. Data transfer is carried out using the tester’s wireless Bluetooth connectivity. Results can be further managed by optional Megger Powersuite Lite software. The Megger MFT1741 is sturdily built with protective rubber casing that gives the tester an IP54 water and dust ingress protection rating. It has test and lock buttons on each side for added practicality and comes supplied with a wide range of basic accessories including test leads, probes, crocodile clips, mains plug test lead, remote rest probe, calibration certificate and carry case.